Original Editors - Lauren Cotton & Erin Smith from Bellarmine University's Pathophysiology of Complex Patient Problems project. Prescription drug abuse occurs when someone uses a prescribed medication for purposes other than what it was intended for, use more than the dose prescribed by the physician, or continue prolonged use after the amount prescribed by the physician was taken. Abuse of prescription medications can produce serious adverse health effects, including addiction. The prevalence of prescription drug abuse is at a dangerously high level. According to the Centers for Disease Control, “In 2010, about 12 million Americans (age 12 or older) reported nonmedical use of prescription painkillers in the past year”. The results of the National Survey on Drug Use and Health (2010) showed that “an estimated 2.4 million Americans used prescription drugs non-medically for the first time within the past year”. These numbers show that this problem is one that deserves the attention of the healthcare community. The Drug Abuse Warning Network, which monitors emergency department visits across the country, stated that “an estimated 1,079,683 ED visits in 2009 involved the nonmedical use of prescription drugs, over-the-counter medicines, or other types of pharmaceuticals“. Prescription pain relievers were the drugs used most commonly, with oxycodone, hydrocodone, and methadone rating the highest amongs the drugs used. The population affected the most by prescription drug abuse includes those ages 18-25, with a percentage of prescription drug use non-medically at 5.9%. However, another age group at a higher risk for prescription drug abuse is the older adult group (65+). More than 1/3 of the total dollars spent on outpatient prescription medications in the US come from this population. Due to the prevalence of co-morbidities and chronic disease, the older population is more likely to be prescribed long term medications as well as multiple medications, which leads to a greater chance for improper use. Some symptoms that you may hear of if someone is abusing a painkiller are subjective complaints of depression and constipation. • In some cases if taken with other medications or alcohol, then you may see decreased heart rate, respiration rate, and an increase in body temperature. • It is also possible to see excessive mood swings, the appearance of being high or sedated, and also an appearance of overly and unusually energetic. Another characteristic that can be seen in someone who is abusing painkillers is noticing medication use that may be interfering with activities. This will be helpful in identifying narcotic abuse in the physical therapy clinic. Also, you may also see your patient continuing to use a medication despite other adverse effects that they may note that they are having. Some of the behavioral and physiologic respones that may be found will largely be dependent upon the actual chemical itself, the route of administration, and the client's circulatory system. The connection between drug abuse and mental disorders is one that has been highlighted in recent literature. As the National Institute on Drug Abuse’s Research Report Series shares, people with mood/anxiety disorders are approximately two times as likely to have a drug disorder, and people with a drug abuse history are about twice as likely to have a mood/anxiety disorder, although it is difficult to prove that one causes the other, or visa versa. According to the National Drug Intelligence Center, around 4.0 million adults in 2002 met criteria for a mental illness and substance dependence or abuse. Another co-morbidity seen with drug abuse is chronic pain. In many instances the reason that a painkiller is prescribed is for relief from serious pain symptoms. The pain can stem from a surgical procedure, a traumatic event, or can be due to chronic severe pain. The most concerning situation is a combination of both co-morbidities, a patient with chronic pain and consistant drug abuse that also has a mental disorder. An article in the Pain journal states that “to our knowledge, no guidelines currently exist for managing opioid misusers with chronic pain and a psychiatric or substance abuse history.” Due to the high risk of abuse and overdose that comes with opioids, these drugs should be prescribed and monitored carefully. • Naltrexone – long-acting opioid receptor blocker that can be used to help prevent relapse. It can only be used for someone who has been through detox. • Naloxone – short-acting opioid receptor blocker that counteracts effects of opioids. This drug can also be employed to treat overdose. • Suboxone – In a 2011 study performed by the National Health Institute, they found that Suboxone (Buprenorphine plus Naloxone) was useful to treat those addicted to opioid painkillers in a primary care setting. However, they do mention that further research is still required to figure out how to sustain recovery among those who are addicted to opioid medications. Even though patients with substance abuse can be treated with some of the above medications, long term use of these can also lead to potential negative side effects. 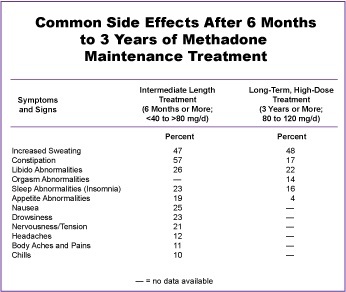 Below is a table of the common side effects of methadone use after a long period of time. The Drug Abuse Screening Test (DAST): This test is a self-reported 28 question test to screen for drug abuse. The questions are in yes/no format and the tests reports that a score of more than 12 strongly suggests a substance abuse problem. NIDA Quick Screen V1.0: This test is a quick patient reported questionnaire of alcohol, drug, and tobacco use that can be followed up with the NIDA-Modified ASSIST test if a patient identifies using prescription or illegal drugs for non-medical reasons. Urine Toxicology Screens: screen designed to test for illegal drugs and some prescription drugs in the urine. Most drugs will cause a positive test for 1-2 days after ingesting, but some can continue for longer. A GC-MS Test can be used following a positive urine toxicology screen to ensure that the test was not a false positive. GC-MS Test: A gas-chromatography mass spectrometry test can be used to help confirm or deny a flase positive on a urine toxicology screen. False positive readings can occur from factors such as some foods, prescription medications, and other drugs ina person's system at the time of the test. • Biology – The genes that people are born with along with their gender, ethnicity, and the presence of other mental disorders can potentially influence the risk for drug abuse. • Environment – Family, friends, socioeconomic status, quality of life, peer pressure, history of physical and/or sexual abuse, stress, and anxiety can place someone at a higher risk for drug abuse. • Development – Critical developmental stages can be affected by genetic and environmental factors that can lead to an increased risk for drug abuse. A large cause of painkiller prescription drug abuse is to reduce pain associated with acute or chronic conditions, and some people who may have been taking prescription narcotic painkillers for a long period of time could develop a dependency on the drug which in turn could cause drug abuse. Below is a video that can help to understand how someone with pain issues can cause and substance abuse and possible dependence. If someone has been using opioids for a long time, then it may be difficult for them to stop the use because of the dependence and possible fear of increased pain which can in turn continue to lead to painkiller abuse. All drugs are capable of producing unwanted side effects. In the case of prescription painkillers the list is longer than some, warranting the need for medical clearance and monitoring while on these drugs. According to the National Institute on Drug Abuse, past research has shown that addiction to any drug can be treated effectively. The first step to any drug treatment plan is detoxification, to cleanse the person of the drug or drugs in the system. The next step in the process involves a combination of treatments that typically fit into one of two categories: behavioral and pharmacological treatment. Behavioral treatments can include a combination of individual counseling, group or family counseling, contingency management, and cognitive behavioral therapies. This form of treatment focuses on preparing oneself to face challenges including cravings and withdrawal, learn strategies to cope without the drug and avoid situations that could tempt the person to partake, and finally plans to handle potential relapse. Pharmacological treatment is not used for treatment of all types of drug abuse, but has been proven through research to be effective in treating the abuse of opioid drugs, a category that includes prescription painkillers. The medications available for treatment are able to help reduce withdrawal symptoms and help overcome cravings. These medications are listed and described in the Medication section of this page. Physical therapists are not qualified to treat prescription drug abuse, either with behavioral or pharmacological treatments, but that does not mean that this is a problem PTs should ignore. An important part PTs can play is in recognizing the signs and symptoms, screening a patient when a problem is suspected, and making sure to ask each patient about all drugs, prescription and over the counter, that they are currently taking. If a PT suspects the potential for drug abuse they should report all findings to the referring MD or primary care physician as well as discuss with the patient the dangers of taking prescribed medication outside of the recommendation of an MD. Before a Physician can accurately determine if patient is abusing narcotics they must determine if there is another cause for their symptoms. Below are listed some differential diagnoses that someone may with signs and symptoms of opioid abuse may suffer from. Some of the above mentioned conditions can cause symptoms of "delirium and cause slurred speech, inability to concentrate, and impaired memory, which are also signs of intoxication." In order for a Physical Therapist to try to determine if someone is abusing a substance such as narcotic painkillers some follow-up questions will need to be asked. The questions to be asked can assist in diagnosing someone because they "are based on the established correlation between trauma and alcohol or other substance abuse." If a patient answers yes tos 2 or more of the below follow-up questions then the Physical Therapist should discuss this with the patient's physician. Have you had any fractures or dislocations to your bones or joints? Have you injured your head? Have you been in a fight or assault? ↑ 1.0 1.1 1.2 1.3 1.4 Mayo Clinic. Prescription Drug Abuse. http://www.mayoclinic.com/print/prescription-drug-abuse/DS01079/METHOD=print&DSECTION=all (accessed 15 March 2012). ↑ 2.00 2.01 2.02 2.03 2.04 2.05 2.06 2.07 2.08 2.09 2.10 2.11 2.12 2.13 National Institute on Drug Abuse. InfoFacts: Prescription and Over-the-Counter Medications. http://www.drugabuse.gov/publications/infofacts/prescription-over-counter-medications (accessed 19 March 2012). ↑ The Free Dictionary. Narcotics. http://medical-dictionary.thefreedictionary.com/Narcotics (accessed 19 March 2012). ↑ 4.0 4.1 4.2 4.3 4.4 4.5 4.6 National Drug Intelligence Center. Prescription Drugs Fast Facts. http://www.justice.gov/ndic/pubs5/5140/index.htm (accessed 19 March 2012). ↑ Zanni G. Pharmacy Times. Rx Drug Abuse: An Escalating Problem with Multiple Causes. http://www.pharmacytimes.com/publications/issue/2007/2007-09/2007-09-6799 (accessed 28 March 2012). ↑ Centers for Disease Control and Prevention. Prescription Painkiller Overdoses in the US. http://www.cdc.gov/VitalSigns/PainkillerOverdoses/#LatestFindings (accessed 15 March 2012). ↑ U.S. Department of Health and Human Services:fckLRSubstance Abuse and Mental Health Services Administration, Center for Behavioral Health Statistics and Quality. Results from the 2010fckLRNational Survey on Drug Use and Health:fckLRSummary of National Findings. http://www.oas.samhsa.gov/NSDUH/2k10NSDUH/2k10Results.htm (accessed 16 March 2012). ↑ 8.0 8.1 U.S. Department of Health and Human Services: fckLRSubstance Abuse and Mental Health Services Administration, Center for Behavioral Health Statistics and Quality. Drug Abuse Warning Network, 2009: National Estimates of Drug-Related Emergency Department Visits. http://www.samhsa.gov/data/2k11/DAWN/2k9DAWNED/HTML/DAWN2k9ED.htm#High6 (accessed 16 March 2012). ↑ 9.0 9.1 9.2 9.3 National Institute on Drug Abuse. Prescription Medications. http://www.drugabuse.gov/drugs-abuse/prescription-medications (accessed 19 March 2012). ↑ NYU Langone Medical Center. Prescription Drug Addiction. http://psych.med.nyu.edu/conditions-we-treat/conditions/prescription-drug-addiction (accessed 19 March 2012). ↑ Jamison RN, Ross EL, Michna E, et al. Substance Misuse Treatment for High Risk Chronic Pain Patients on Opioid Therapy: A Randomized Trial. Pain. 2010 September; 150(3): 390–400. http://www.ncbi.nlm.nih.gov/pmc/articles/PMC2910796/ (accessed 16 March 2012). ↑ National Institutes of Health. Painkiller Abuse Treated by Sustained Buprenorphine/Naloxone. http://www.nih.gov/news/health/nov2011/nida-08a.htm (accessed 19 March 2012). ↑ Medscape Reference. Opioid Abuse Treatment and Management. http://emedicine.medscape.com/article/287790-treatment (accessed 19 March 2012). ↑ National Institute on Drug Abuse. Question 12: Is the long term use of methadone medically safe and is it well tolerated by patients?. http://international.drugabuse.gov/educational-opportunities/certificate-programs/methadone-research-web-guide/part-b/question-12-long- (accessed 3 April 2012). ↑ Substance Abuse Screening Instrument. The Drug Abuse Screening Test (DAST). http://www.drtepp.com/pdf/substance_abuse.pdf (accessed 28 March 2012). ↑ 17.0 17.1 Medline Plus. Urine drug screen. http://www.nlm.nih.gov/medlineplus/ency/article/003364.htm (accessed 15 March 2012). ↑ 18.0 18.1 18.2 18.3 WebMD. Mental Health. http://www.webmd.com/mental-health/drug-abuse-addiction?page=2 (accessed 19 March 2012). ↑ NIH Medline Plus. Opioids and Chronic Pain. http://www.nlm.nih.gov/medlineplus/magazine/issues/spring11/articles/spring11pg9.html (accessed 19 March 2012). ↑ About.com Addictions. How Painkiller Addiction or Overuse Happens. http://addictions.about.com/od/substancedependence/tp/painkillers.htm (accessed 28 March 2012). ↑ 22.0 22.1 Benyamin R,Trescot AM, Datta S. fckLROpioid Complications and Side Effects. Pain Physician 2008; 11:S105-S120. http://www.painphysicianjournal.com/2008/march/2008;11;S105-S120.pdf (accessed 15 March 2012). ↑ National Institute on Drug Abuse. Research Reports: Prescription Drugs: Abuse and Addiction. 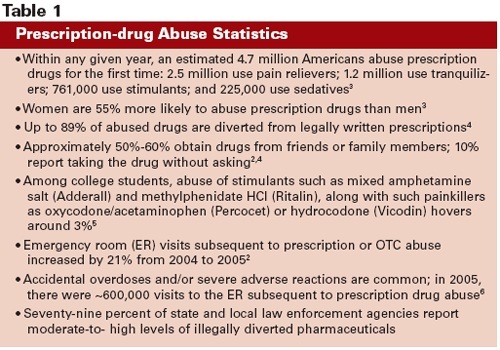 http://www.drugabuse.gov/publications/research-reports/prescription-drugs/opioids/what-are-possible-consequences-opioid-use-abuse (accessed 16 March 2012). ↑ 24.0 24.1 24.2 24.3 National Institute on Drug Abuse. Treating Prescription Drug Addiction. http://www.drugabuse.gov/publications/research-reports/prescription-drugs/treating-prescription-drug-addiction (accessed 1 April 2012). ↑ American Physical Therapy Association. Guide to Physical Therapist Practice. http://guidetoptpractice.apta.org/ (accessed 29 March 2012). ↑ Medscape Reference. Opioid Abuse Differntial Diagnosis. http://emedicine.medscape.com/article/287790-differential (accessed 1 April 2012). ↑ 27.0 27.1 27.2 27.3 27.4 Remedy's Health Communities. Narcotic Abuse. http://www.healthcommunities.com/narcotic-abuse/diagnosis.shtml (accessed 1 April 2012).